Ready for a history lesson? Erwin Ross Thomas had his hand in the automobile industry almost from the beginning. In 1900 he founded two companies: Auto-Bi (which sold motorized bicycles) and the Buffalo Automobile Company, which built cars (they were pretty much the same company but made different products). Buffalo only built cars through 1902 before Thomas re-named the company after himself and got pretty famous with his Thomas Flyer. That’s Part I. Part II involves two former Oldsmobile workers on a train in 1906 who had just failed to secure funding for a new venture. When they met Thomas in the dining car, he bankrolled a new company in Detroit, called Thomas-Detroit. It only took two years of the former-Olds employees to tire of Thomas’ manage-from-New York-even-though-the-company-is-in-Detroit style and they convinced Hugh Chalmers, vice president of the National Cash Register Company, to buy out Thomas. So the Thomas-Detroit became the Chalmers-Detroit in 1908. In 1911, the Detroit suffix was dropped and Chalmers soldiered on until they merged with Maxwell in 1922 and ceased production in 1923. Then Maxwell become Chrysler. And here we are today. Ta-da! Anyway, this beautiful old touring car is powered by a 30 horsepower 3.7-liter straight-four. The Model K ’30’ was the first car designed under the new ownership and they were expensive. Chalmers-Detroit-branded cars were only sold for three model years, making this car rarer than later Chalmers cars. It has been fabulously restored and is gorgeous. It should sell for between $75,000-$90,000. Click here for more info and here for more from this sale. 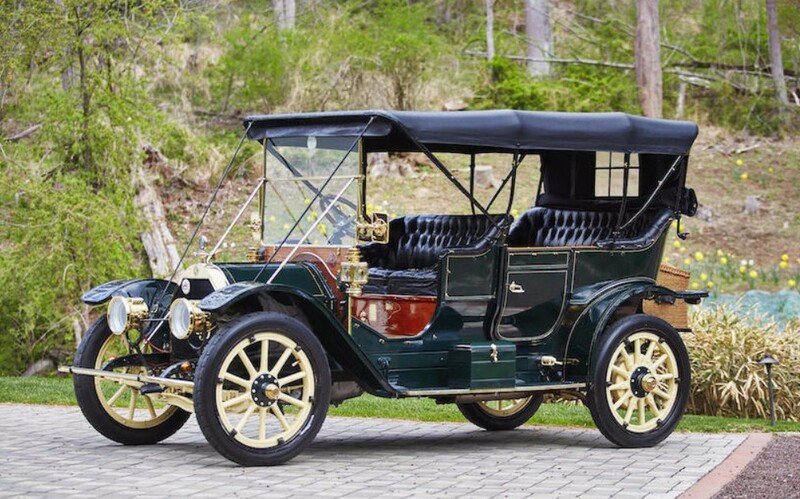 This entry was posted in Uncategorized and tagged 1910, 30, auctions, Bonhams, cars, chalmers-detroit, classic cars, model k, touring by classiccarweekly. Bookmark the permalink.